These Ceramic Candle Warmer Lamps sit on top of your favorite scented candle while the lamp melts the candle from the top down, creating the ambiance of a burning candle, releasing the candle’s aroma. Simply place the lampshade directly on the top of the candle. Also included is a matching ceramic dish for the candle to sit on. 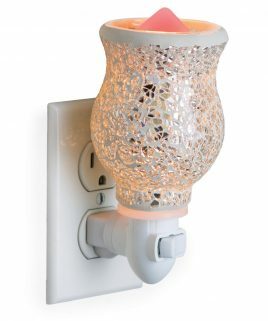 This ceramic warmer lamp works perfect with our 26 oz. 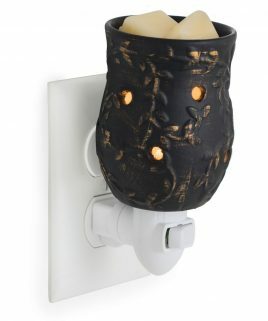 wickless warmer candle. Please choose large or small size in the drop-down box below. This Winter Wonderland Ceramic Warmer Lamp has a midnight blue backgrund with a snowman and Christmas trees hand-painted on the shade.